It’s not that cats are important in Japanese politics. Cats are important. Full stop. This is Satoshi Shima. He previously worked at mobile carrier Softbank, and before that, he was a member of Japanese Parliament. He’s now running to represent the Mikawa region in Aichi Prefecture in the upcoming election. During Japanese elections, candidates plaster their posters all over the areas they’re campaigning. Typically, the posters are rather dull, featuring a headshot of the candidate and their name. They usually have a slogan. In a highly unusual move, Shima put a white cat in some of his posters. The tagline reads that someone has “returned home,” but it’s unclear if that refers to Shima or the feline! As you can see, the cat poster is actually being used. On Twitter, people seem amused and baffled by the posters. But, what gives? 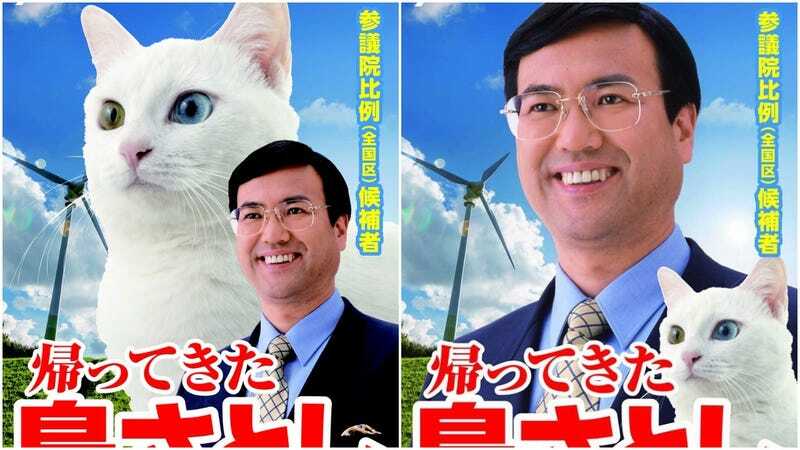 Obviously, this is a political stunt—a humorous and clever one at that—but according to Shima, “If you find one of my white cat posters, you’ll be happy.” So, they’re kinda like four-leaf clovers, but with cats and middle-aged politicians? The poster with the giant white cat is even rarer, apparently, so find that, and you’ll be truly happy. Tell me, are you not incredibly happy right now? While Shima doesn’t appear to be hitting the campaign trail with an actual cat, his campaign van does have a cat on it. Take note politicians! Instead of attack ads, there’s another weapon in your political tool kit. A softer, fluffier one.